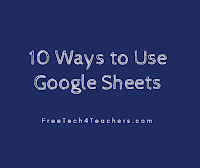 As I mentioned yesterday in my run-down of ten ways to use Google Forms, Google Forms and Google Sheets is the part of G Suite for Education that I get most excited about teaching to others. My excitement comes from seeing how many applications for Google Forms and Google Sheets teachers develop once they understand the basics of how Forms and Sheets work. 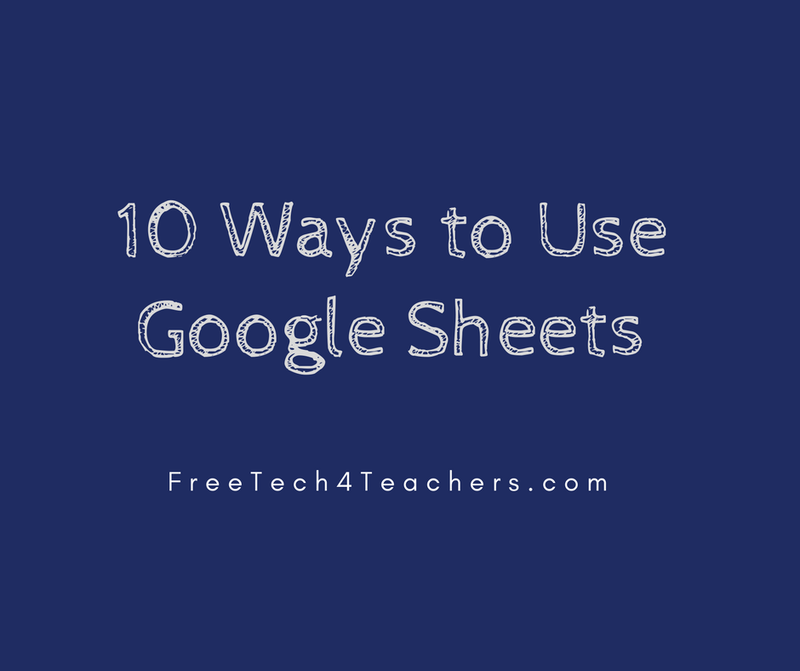 Here are ten ways that you can use Google Sheets once you understand the basics of how to use Sheets. 1. Send personalized emails to everyone in a group. Rather than sending a generic, "hi everyone" greeting you can address each person by name. 2. Create and display progress trackers. This is ideal for things like reading logs or fundraisers. 3. Create flashcards. You can make them or have your students make flashcards from the information in a Google Sheet. 4. Schedule room use. Keep track of who is using a meeting room and when. 5. Develop and publish multimedia timelines. Include pictures, videos, and maps in your timeline. 6. Keep track of iPad/ Chromebook carts in your school. The same logic can be applied to keeping track of anything commonly borrowed in your school. 7. Create maps of data sets. If your spreadsheet contains location data, you can map it from a Google Sheet. 8. Create rubrics and email grades from a spreadsheet. Email scores and feedback from the same place that you recorded scores and feedback. 9. Develop and manage a gradebook. If your school doesn't have a system-wide gradebook system in place, you can create your own in Google Sheets. 10. Create Jeopardy-style games. This staple of review games can be developed and played from a Google Sheet. Register for Google Forms & Sheets for Beginners to get started on using Google Forms for any or all of these purposes.